This is a time when our children need a more structured approach to their development whist still learning through play-based activities. 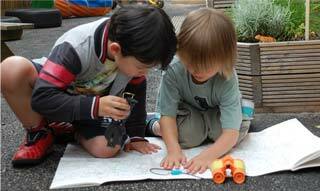 Imaginative play encourages inventiveness and response to their own stories, interests and life experiences. Activities are also focused to encourage communication and literacy such as reading stories and poems, linking sounds and letters, reciting and creating songs and rhymes, recognition of their names, and letters and words. There are opportunities for numeric and problem solving games, mark making, counting, sorting and mathematical language. Group activities and social events, such as eating and playing together, support children for a smooth transition from nursery to school.